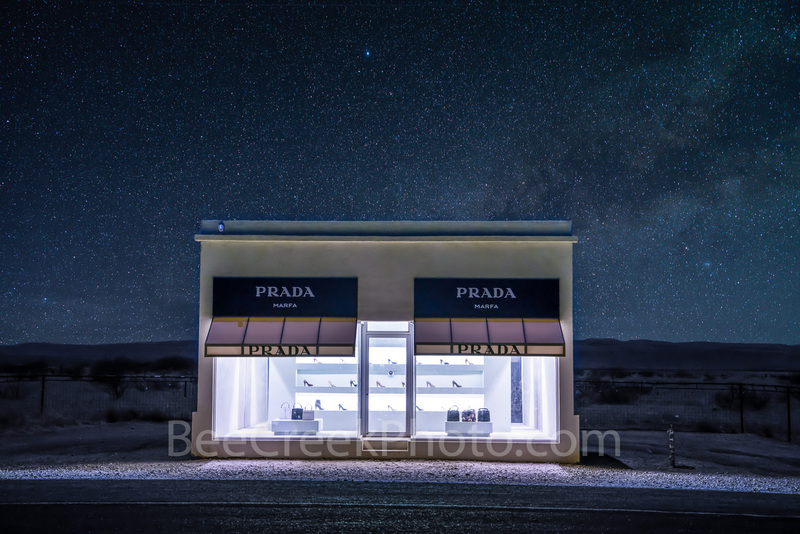 Stars Over Prada Marfa - On our latest trip to west Texas we decided to see if we could capture the famous Prada Marfa building with a background of stars. The one thing about this area of west Texas is its wonderful dark skies where you can actully capture stars. The road between Marfa and Valentine was so dark we thought we might have missed it because it was so dark, but finally, there it was just feet from the road in all it glory waiting for the next photo or selfie, that seems to draw people out here. The permanet exhibit was created by two artist Elmgreen and Dragset in October 2005 to resemble an actual Prada store. The two refer to their work as pop architectual land art with a bit of humor. They built this structure about 24 miles outside of Marfa in a city called Valentine Texas population around 200. To make it more interesting they found the least likely place to find a store like this and stuck in in far west texas. They added only right shoes and the purses have no bottoms. They have been vandalize several times now I guess people in this area like prada more than they knew. I am not sure what they were saying or not saying about their art. Maybe they were making fun of consumerism but you would have to ask them. As a photographer it great fun to shoot such a unique image. After the latest vandalism they have install cameras and the purses have GPS devices inside that detect movement so making it more difficult to shop there in the future. We had been to see the Marfa Lights many times but never venture over to Valentine to see the Prada Art display and we were glad we finally made it. Having this wonderful starry night sky really helped it pop out as a winning venture for us. Thanks for looking.